Yesterday, at around 18:00, at Maiorsk checkpoint Russia-backed militants opened small arms fire against civilians moving to the government-controlled territory. Having found themselves on the line of fire, people had to run towards Ukrainian positions, where the military provided them with support and protection. “It was not the first time when Russian proxies disregarded Ukrainian citizens’ lives and safety and used them as a human shield for their armed provocations,” reported Ukrainian Ministry of Defense spokesman on ATO Colonel Oleksandr Motuzyanyk at a press briefing at Ukraine Crisis Media Center. Speaking of the other incidents, in ATO zone hostilities took place in Donetsk and Mariupol sectors yesterday. Ukrainian troops recorded 14 and five attacks correspondingly there. In Donetsk sector, militants violated the ceasefire near Horlivka, in Avdiivka, and near Donetsk airport. Most attacks took place after 16:00. “The enemy used armor in Pisky, the other incidents involved light weapons only. Ukrainian troops returned fire in all key flashpoints,” said Col. Motuzyanyk. In Mariupol sector, Russia-backed troops opened fire in Pavlopil – Shyrokyne frontline at dawn and in the evening. 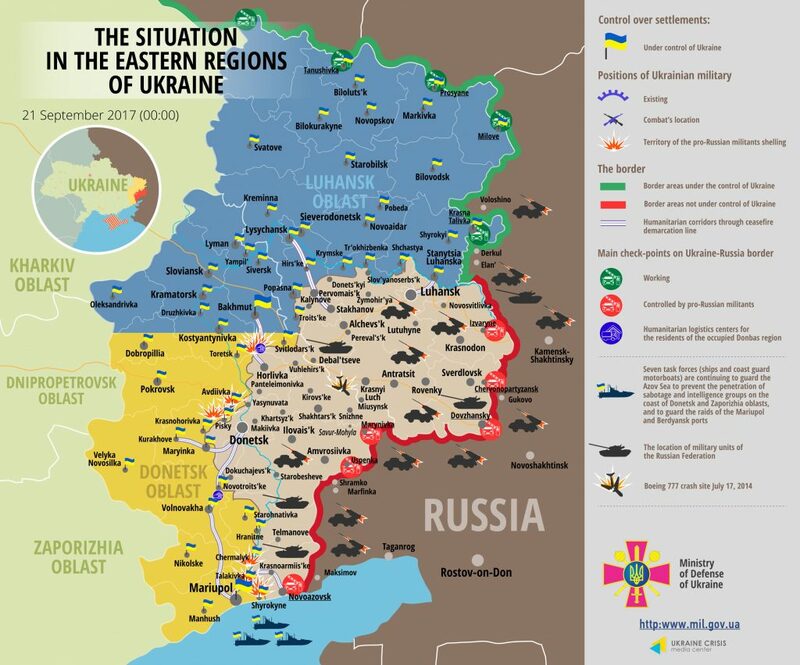 Militants used mortars twice, each attack continued 10-60 minutes. The ceasefire held in Luhansk sector yesterday. No Ukrainian serviceman was killed in action, but one soldier was wounded in a hostile attack in Avdiivka yesterday. “We received updated information on Ukrainian troops’ losses on September 19. One Ukrainian serviceman was wounded in a hostile shelling in Pisky,” added Col. Motuzyanyk. Report on the military developments as of September 20 is available here. Interactive data on the shelling: chronology shelling chart and the interactive map.